Catch up on all the latest apple videos by clicking in the above player. Walk into almost any grocery store in America, anytime of the year, and you will find the same varieties of easily recognizable and perfectly shaped apples. Mostly notably are the Red Delicious, the yellow green Golden Delicious and the green Granny Smith. If you are lucky you may find a few other varieties (red and green McIntosh, red and yellow Gala, Braeburn, Fuji, and the red Rome) especially during the Fall harvest time. This is surprising when you think that there are over 7,000 named varieties of apples in the world. Unfortunately the consumer seems to value perfection in their apples (perfect size, shape, and color) over taste and the producers compound the problem by only growing apples that are profitable (have high yields and long storage qualities). A. J. Liebling in 'Between Meals' says of the consumer "They have made a triumph of the Delicious apple because it doesn't taste like an apple, and of the Golden Delicious because it doesn't taste like anything." It is believed that the wild crab apple was the first fruit known to man and one of the first fruits to be cultivated. There are many references to the apple in Greek mythology. In fact, the ancient Greeks would call any unknown round fruit that grew on a tree an 'apple' often distinguishing it only by its country of origin. For example, the Greeks called citrus fruits "Persian apples" and apricots "Armenian apples". Many times the term "golden apples" was used and it is now thought the Greeks were probably referring to lemons or oranges. It wasn't until the 17th century that permanent names began to stick to certain fruits. Apples were brought to the New World by the Pilgrims in 1620. The beginning of the westward cultivation of apple trees is credited to the now famous Johnny Appleseed, although not by him simply tossing around apple seeds as legend has it. Johnny Appleseed was born John Chapman in Leominster Massachusetts in 1774. Around 1800, starting in Pennsylvania and moving westward to Indiana, he established nurseries and planted apple trees everywhere he went until his death in 1845. At about the same time, 1824, Captain Aemilius Simpson planted the first apple seeds in the Northwest (Washington) which is the now the top apple producer in the United States. Apples come in so many colors, shapes, and sizes. Their flavor can range from crisp and sour to soft and sweet. The beauty of the apple is that its taste will change from year to year depending on the growing conditions. 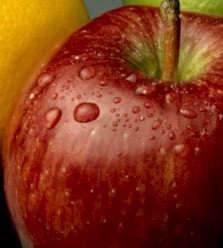 In fact, flavor can vary from apple tree to apple tree and even from orchard to orchard. So whenever possible buy your apples from a local orchard or farmer's market and remember what Horace once said "Whatever variety of apple you eat, to get the best make sure to buy only those picked by the light of the waning moon". Behr, Edward. The Artful Eater. New York: The Atlantic Monthly Press, 1992. Davidson, Alan and Knox, Charlotte. Fruit. New York: Simon & Schuster, 1991. Grigson, Jane. Fruit Book. London: Penguin Books, 1982. Harrison, S.G., Masefield, G.B., and Wallis, M. The Oxford Book of Food Plants. London: Oxford University Press, 1969. Liebling, A.J. Between Meals An Appetite for Paris, New York: Farrar, Straus and Giroux, 1959. Marian, John F. The Dictionary of American Food & Drink, New Haven and New York: Ticknor & Fields, 1983. Root, Waverley, Food. New York: A Fireside Book, 1980. Whiteman, Kate. The New Guide to Fruit. New York: Lorenz Books, 1999.